FFWPU Romania, Bucharest, Romania, 7. November 2014: We had the special grace to welcome Continental Director Rev. An Yong Shik, Dr. Kim Man Ho who is General Secretary of FFWPU International HQ with Mr. Sam Nagasaka who is working for Vision 2020 in the International Headquarters. Before the event we were all very nervous and anxious to meet them in order to hear their message. We made preparations for the event with sincere heart from the morning. We started singing Cheon Il Guk anthem and other holy songs in order to raise up our spirit to receive the message that Heavenly Parent desires to give us through our special guest. We could create good atmosphere through singing. We had joyful hearts to receive them. Our National Leader Mr. Jeong Bong Moon brought the special guests in Peace Center. We sang again Cheon Il Guk Anthem. Romania brothers and sisters offered a Romanian song titled Edelweiss and a Korean song Sarang Hae because our Leaders come from South Korea. We invited our National Leader Rev. Jeong Bong Moon to introduce the main speakers of the evening. In his words Rev. Jeong said that Heavenly Parent and True Parents came to Romania and we are so blessed and loved by them. Rev. Jeong expressed his gratitude to Rev. An, Dr. Kim and Mr. Nagasaka to visit Romania in this moment. Rev. Jeong invited Continental Director Rev. An to give his special address. Rev. An said that we are lucky living in this time. We will be in the Gospel book of True Parents. He asked us why we believe that True Parents are the Messiah? What happened after True Parents came to the earth? Why we are living in this time? Why the world developed incredibly? What critical element could bring this change? It was due to God’s Blessing. He mentioned that working with True Parents we can do great things, we are great when we work with Heavenly Parent. We should fulfill our responsibility as Tribal Messiahs. We all felt how precious is for Europe to have Rev. An as a Director. The second speaker, Mr. Sam Nagasaka gave a small testimony of how he met the Unification Church and what is his mission now. He feels a special destiny with Romania and Albania. In his speech he mentioned that Romania is at crossroads. That Heavenly Parents creates changes. There is a reason why we are here, to restore the past and create the future. He was very happy to be here and share with us. He askedthe audience who is couple, how old are the brothers and sisters. After his address Dr. Kim suggested for Mr. Nagasaka to offer a song for Heavenly Parent. 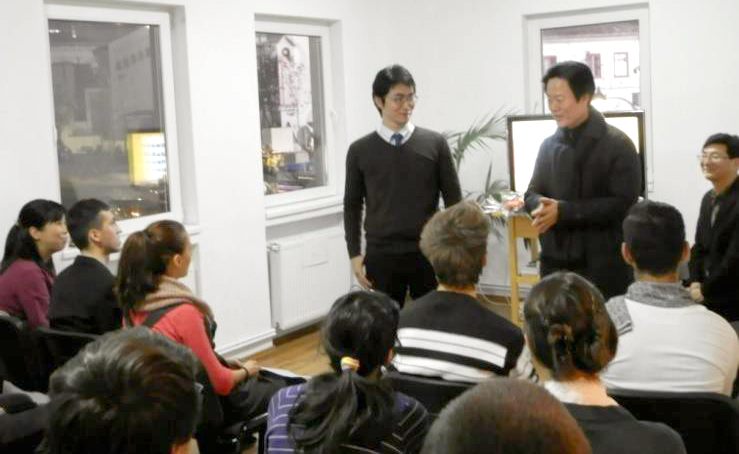 It was for the first time in Romania to have General Secretary Dr. Kim Man Ho. Most of us didn’t know anything about him. Dr. Kim started his main address by saying that we are pure and we shine. He asked us who is our Father? Through True Parents he received the biggest present which is Heavenly Parent. In our life we should never let go of Heavenly Parent otherwise will have a difficult life. Many people don’t understand Heavenly Parent, they don’t get married as a result they are unhappy. But after they study the Divine Principle they change their thinking. There is no valuable work that teaching about family and if we can make Heavenly Parent ours we can do anything. The atmosphere was high and full of harmony and love could be felt and share from both sides. We truly felt that that is Heavenly Parent grace come upon Romania once more and this is a new beginning for Romania and for each of us …once again to dedicate for Heavenly Parent & True Parents and unite with True Parents for realize the vision 2020 in a substantial victory . We will like so show our deep gratitude for the special words given by Rev. An Yong Shik, Dr. Kim Man Ho and Mr. Sam Nagasaka.